The Cedesol Solar Cooker is an ecological cooker that combines renewable energy with appropriate technology to conserve the economic, natural and human resources involved in food preparation. The solar cookers are made from wooden boxes with one or more reflective covers and an inclined double glazed window on hinges. 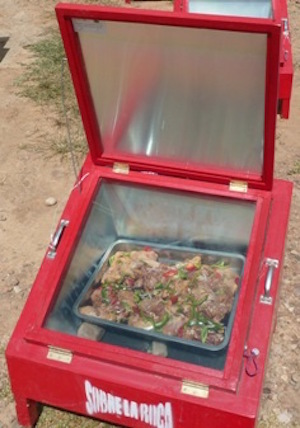 Easy to build with inexpensive materials, Cedesol Solar Cookers can reach temperatures between 120°c and 160°c, which is sufficient for cooking nearly all of the foods consumed in Bolivia. The sun’s radiant energy passes through the glass and is both absorbed and reflected by the various materials to focus heat on the food for the most efficient cooking process. The solar cooker is also filled with insulation that considerably reduces loss of energy.